My fishing fortunes have improved drastically in the last week. In fact, I have been on the water 3 out of the past 6 days which is doing well in my book. The life of an assumedly responsible adult tends to not have time for fun activities like fishing and skiing (yeah I did that also in the past few days). 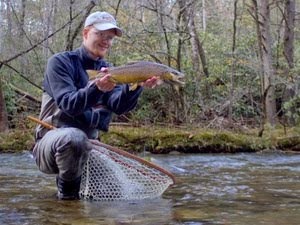 The warm water trip last Thursday is what kicked off the recent string of fishing opportunities. Friday afternoon, after getting off work at 1:00, I was off to fish again. My destination? Clear Creek of course. 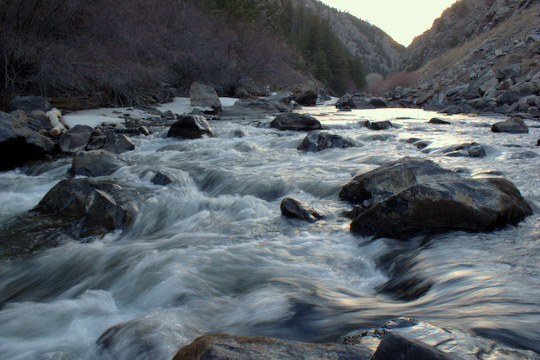 You see, there is something about this stream that keeps pulling me back. 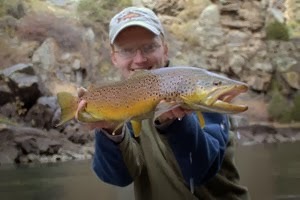 After winter lockdown, I was getting a bit antsy to fish Clear Creek again. 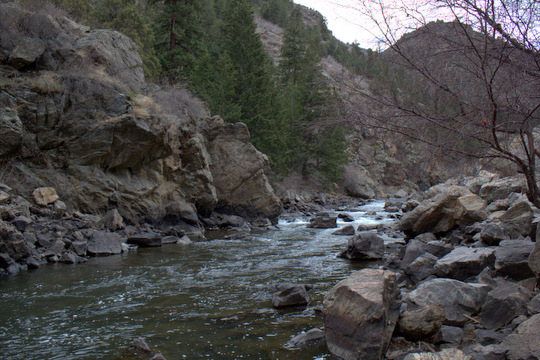 According to the streamflow gauges online, it seemed likely that the entire stream was open through the canyon between Golden and Idaho Springs. 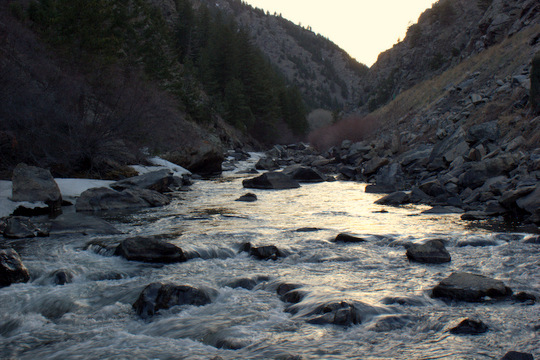 Of course, even without that bit of technology, the recent warm weather had me convinced that it was time to fish Clear Creek again. I arrived and rigged up my trusty 9' 5 weight Legend Ultra with a streamer. I was already convinced that I could catch fish on nymphs and wanted something a bit more fast paced. Soon I was picking my way down a steep boulder covered embankment. As I stumbled slowly down towards the creek, I grew excited. That pool looks perfect, just one last step on that rock and I'm down...well, maybe two more rocks. As it turns out, I'm not Superman, so when that first rock started to roll under my foot and I went airborne, I failed to maintain my flight. The rock was large, between 200 and 300 pounds. The whole way down I was hoping it wouldn't land on me while also thinking, this is going to hurt. 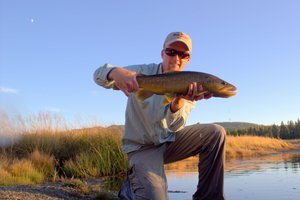 After completing a textbook perfect crash landing, I glanced at my fly rod. Still in one piece. Next I glanced at my camera bag and dug out the camera. Also still in one piece. That's about the time I realized that several previously unnoticed aches and pains were making themselves manifest. My hand required the most immediate attention. Blood was welling up from a nasty scrape that had removed a sizable chunk of skin on my palm. Next I noticed that my elbow hurt, a lot. And why do my legs hurt? I need those to get around on the stream. After a few minutes of sitting by the water and breathing slowly, I remembered that my goal was to fish. I was clearly just stumbling around up until this point. I took several additional minutes to put pressure on the bleeding area until I had it under control. No one wants too much blood all over their fishing gear. Figuring I would just avoid putting that hand in the water and thus avoid infection, I finally rose to my feet and put the past behind me. I'm here to fish, and fish I shall. Soon my streamer was plying the beautiful pool. After the second cast, I saw a nice fish rise. Enough BWOs were on the water to get the fish looking up. Most fish were still sitting on the bottom I noticed. 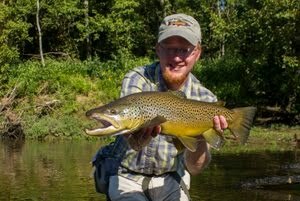 After several more fish failed to commit to the streamer, I switched over to a nymph rig. 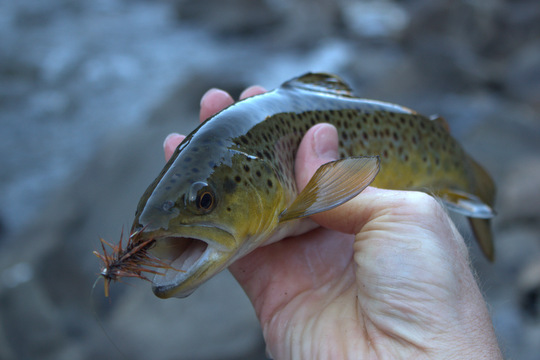 My Ultra Wire Soft Hackle with a RS2 trailing seemed like a good combination, and sure enough, the fish went nuts over the soft hackle fished deep. I had to play with the amount of weight until I had the flies ticking the bottom but then it was game on! 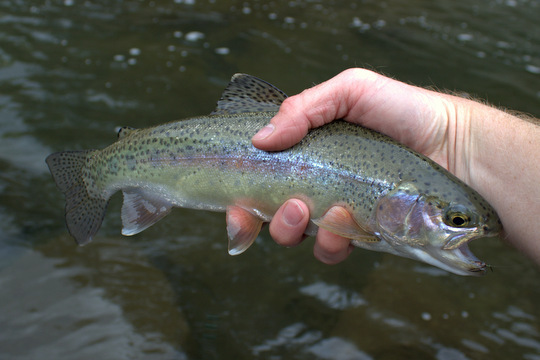 The first fish was a healthy rainbow, and I soon caught another. 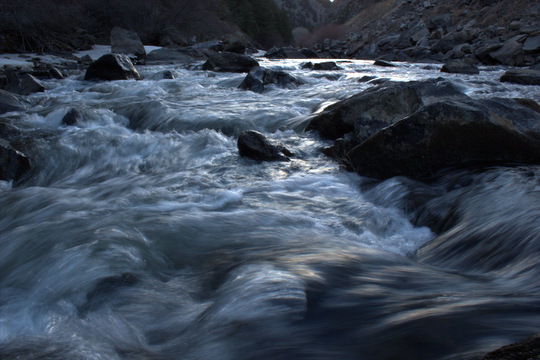 Pain was now a distant memory as I continued upstream. After another angler jumped in right above me (helllllllllo people, there is a whole CANYON of fishable water...no need to jump in front of someone), I decided to head up to another favorite stretch I have fished before. The nymphs continued to work very well. 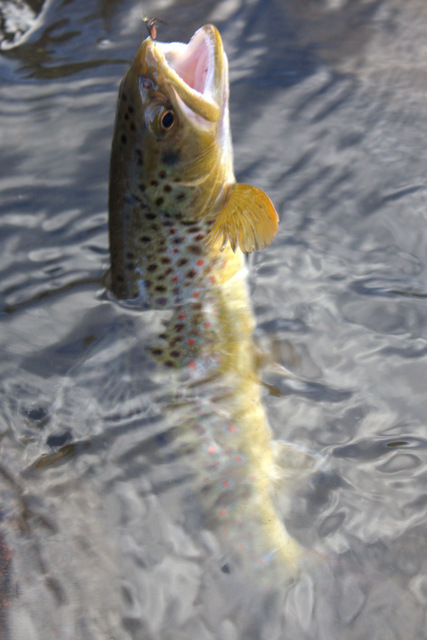 In fact, I soon had caught so many fish that I started wondering again about the streamer. Instead of tying on the same white streamer, I decided to try something darker. 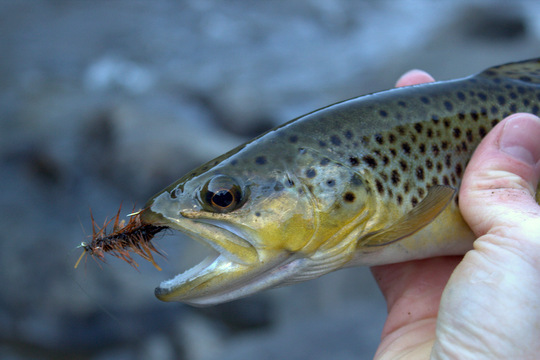 A #8 Crawbugger tied in the style that Iain Emmons over at the Oak Creek Angler uses proved to be just the right choice. 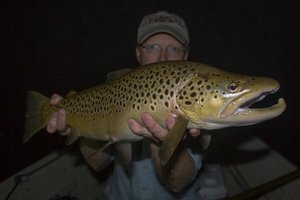 I was surprised at some of the spots producing fish. 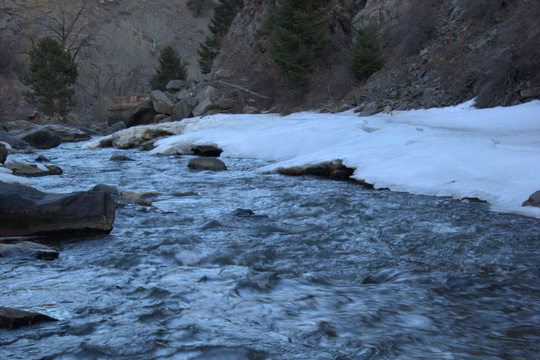 This new stretch of Clear Creek had more pocket water than pools. 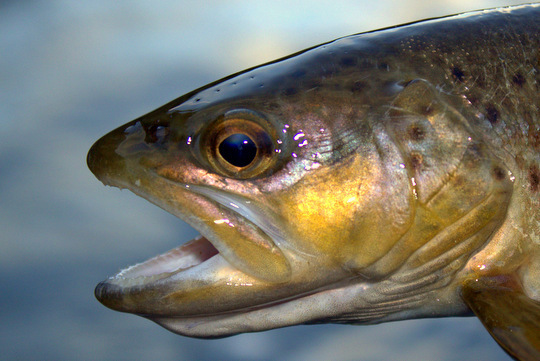 In general, fish will pod up in the deep pools for winter, but it soon become apparent that the fish had spread out as spring approached. I was either catching or spooking fish out of almost every pocket along the bank I was traversing. 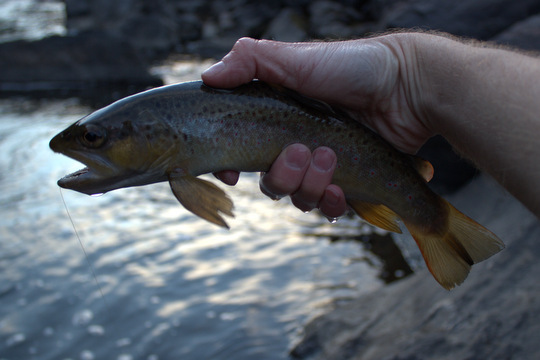 My casts across the stream to the far bank produced fish as well. The fish were hungry and willing to play. 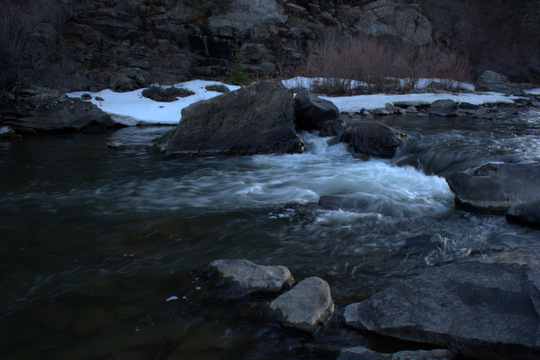 Finishing up this next stretch of water, I decided to venture further upstream and explore a bit. Not far above one of the tunnels I found some more good water. Again the streamer worked its magic. Lots of fish were following now as the light grew dimmer as the sun sank towards the horizon. 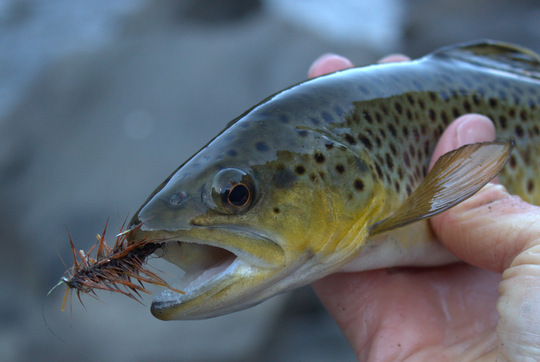 A few tiny fish managed to find the hook but mostly the streamer produced nicer fish. 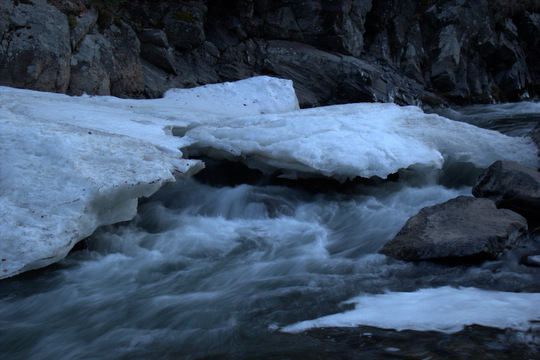 Large snow banks were still present on the shady side of the stream. 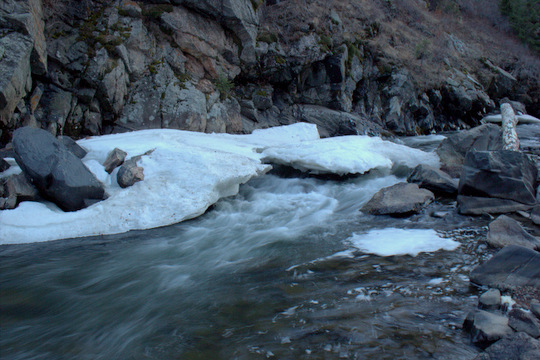 Despite the recent warm temperatures and the fact that I had been comfortable wet wading, there is still a bit of ice to melt in the canyon. I'm sure the recent snowstorm briefly added to that total as well. In general though, spring fishing is here. Looks like a beautiful stream. Well done. Nice post. Glad you and your gear survived. Be careful out there. I sure try to be careful, but it seems I take one or two really good falls a year. So far they aren't catching up with me but I'm not getting any younger either... Thanks for reading! BobT, it is a great little stream! I'm still waiting for one of those nice surprises. I'll keep trying and thanks for the tips on where to focus those efforts! Bill, all the nymphs were fished dead drift and that's how I was catching fish. The streamers I fished both dead drift and stripped and I had success both ways. I have considered guiding many times but so far have not bothered. The red tape is a bit of a hassle although if a shop was willing to pick me up on their permits I would consider some part time guiding, especially in the summer. Beautiful David. When I was in northern michigan fishing the rocks weren't my issue but the ice from the river that was pushed up onto the banks. A few of us took many spills and had the same "I'm here to fish" mentality that you did. This week it was the mud plus the ice! Great read. Love the pics and I'm glad you are okay and came out with some landed fish! 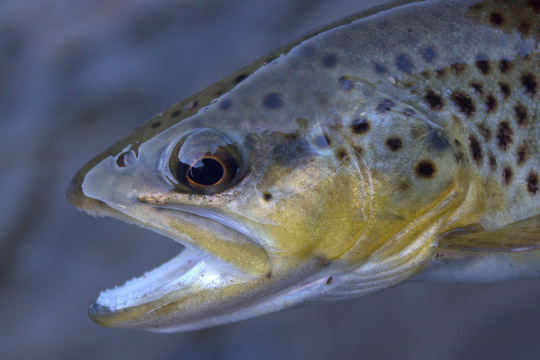 Nice post, and good to see you finding some willing wild trout in your backyard. And nice Crawbugger too, that streamer looks familiar! 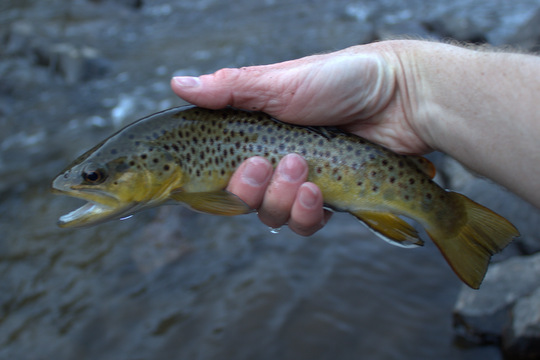 That pattern has been really effective for me time and again, particularly with browns, in the canyon streams of Arizona and beyond, and it looks like it was effective for you as well. Thanks for stopping by Iain. That fly has been great for me.